The Cabinet is a 400-year old building, and is considered a village icon – it even appears on the village sign. It is believed to be the only pub in Britain bearing the name. The Action group is grateful to Dale Ingram for the research in the article below. An undated leaflet, Barkway Parish: Public Rights of Way Guide says, “The Cabinet began life as a tiny weather-boarded house and was once used as a meeting house by exiled French Huguenots.” If true, is is possible that the Cabinet, dated late 17th century by the list description, was in fact constructed as a meeting house for the Huguenot population in the area. It is not at all uncommon for small congregations to adopt or construct buildings of domestic appearance and scale for worship purposes. 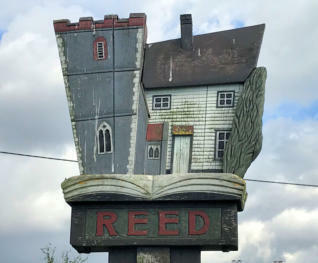 According to William Branch Johnson, Hertfordshire Inns, published in 1962, there has been a public house in Reed since at least 1657, when it was kept by Hugh Ivens. He says “whether this was the later Cabinet is unknown”. He continues, “In 1806 the Cabinet (named at that date) was held by Ann Valentine and was acquired … in the 19th century by J & J E Phillips of Royston, brewers.” A photograph of the Cabinet, obtained from the National Monuments Record in Swindon, shows that at the time it was taken (1960) it was owned by Manns Brewery. By the Census of 1851, the Cabinet was being run by Daniel and Martha Drage. He gives his occupation as Agricultural Labourer and Publican. There are further references to the Cabinet and the Drage family in Reed in the newspapers throughout the 19th century from 1842 onwards. It was not at all uncommon for farmers to double up in this way, with the wife working as 'brewster' in the scullery or an outshot to the rear, while the husband came home at night to be the 'host'. In 1866 Daniel Drage's death from head injuries following a fall from a cart and an assault by his wife Martha is recorded in the local paper. 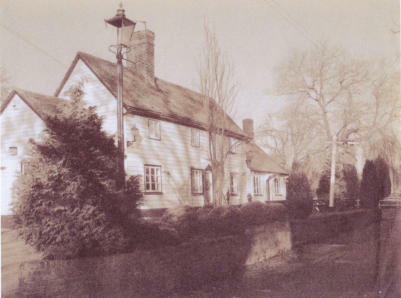 In the 1871 Census, Martha's parents have moved in with her and her son George to the 'Cabenet' at Reed. By 1881 'The Cabinet Inn' is occupied by Alfred Bonfield, who gives his occupation as Blacksmith, and his family. Again, it was not at all uncommon for the tenant to hold two occupations - farmer or blacksmith or shopkeeper as well as ale house keeper or publican. The publican blacksmith's customers could refresh themselves while waiting for their horses to be shod or implements or wheels repaired, giving the blacksmith a second source of income. Hence the many pubs called the “Three Horseshoes” “Anvil” and “Blacksmiths Arms” and the preoccupation with vehicles (waggons, ploughs and coaches) and horses of every colour. 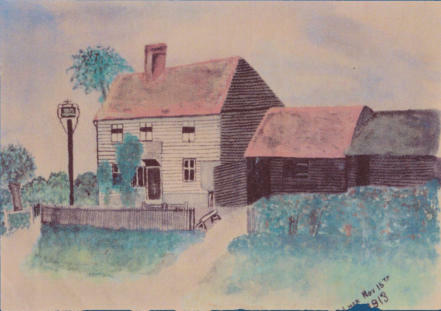 A great many traditional pubs had a forge tucked away behind the main building, as at the Grade II Black Horse in Brent Pelham where it (or a replacement) survives today as 'The Old Smithy', a dwelling. The 1891 Census records William Burns, 'publican' and his wife Emily in possession. George Hills, 'publican and farm bailiff' with his wife and five dependants are recorded there in 1901. George & Mary Ann his wife and four dependants still in occupation in 1911. The Cabinet is recorded as having 6 rooms, 'not including kitchen, scullery, lobby, bathrooms, hallways' etc. Until 2003, The Cabinet was a thriving, popular village pub, marketed as “a little gem”. It subsequently traded successfully as a gastropub and went through various owners afterwards. The recent owners were: • up to 1997: Sedgwick Rough family. • 1997-1998 Greg Molen • 1998-2003 Owned by Denby & Jane St. John-Williams, managed by Ross Moynihan and Justin Scarborough- Taylor. • 2003-2005 Paul Bloxham & Co Paul Bloxham and PJ (brother in law), when the Cabinet was run as a fine- dining “gastropub” • 2005-2008 Simon Smith & Mark Hagger, Simon, Dawn and others. This was the biggest Cabinet era for weddings. • 2008-2011 owned by Albanwise: managed by Angus Martin. The Cabinet closed in 2011 and was put up for sale. 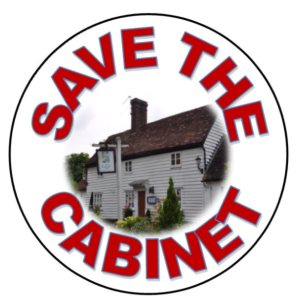 The Save the Cabinet Action Group submitted evidence demonstrating that closure was brought about for reasons unconnected with the pub’s viability - and that it was and remains viable as a pub. The Action Group provided evidence to the Planning Authority of several offers to buy the pub which were refused by the then owners. It was eventually sold at auction in late 2015 to the present owner for £375,000. Documents before the Planning Control Committee, submitted by the present owner, suggested that the building was, as a pub, valued at no more than £250,000. The kitchen was removed during 2015, and further works were carried out in mid-2016. Despite complaints by Reed Parish Council and neighbours, the planning authority, North Hertfordshire District Council, did nothing to prevent these works or enforce planning requirements. The retrospective applications for planning and listed building consent were submitted in September 2016. 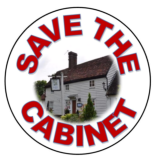 The Save the Cabinet Action group was formed soon afterwards. 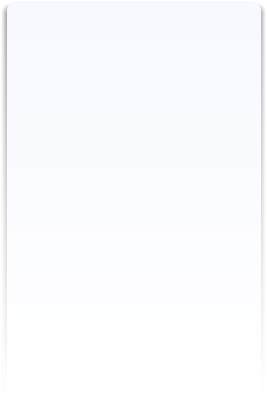 A meeting of Reed Parish Council was convened to consider the applications. Some 70 members of the public attended. The Parish Council opposed both applications. 94 written objections to change of use were subsequently submitted to the planning authority. After a number of postponements, on 20 July 2017, the Planning Control Committee of North Hertfordshire District Council met to consider the application for planning permission for change of use. They refused it by 10 votes to 2. The developer has now lodged an appeal against this decision.